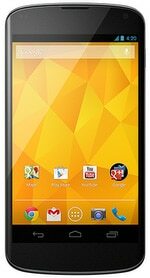 The Google Nexus 4 is the search giant’s hero ‘pure Google’ phone for 2013. The device is built by LG, and sports a 4.7-inch 1280×768 pixel screen which gives a resolution of 320 ppi. The Nexus 4 is powered by a Qualcomm Snapdragon S4 Pro and features an 8MP camera. Notably the device is well specified and surprisingly inexpensive, with the 8GB model available unlocked from Google for just £239. The Google Nexus 4 runs Android 4.2 ‘Jelly Bean’ and started shipping on 13 November 2012. The Nexus 4 is now no longer available and has been replaced by the Nexus 5.